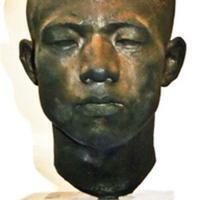 Black patinated bronze of male head on a black marble base. The figure is an Asian male. 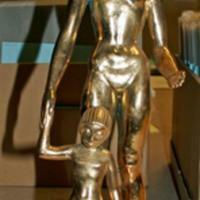 Gold plated gilt bronze of the Mother and Child or Two Sisters sculpture. 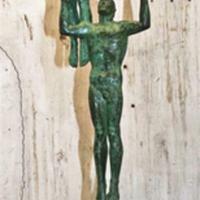 Bronze sketch model with green patina on black marble base for the Fountain of Eternal life. 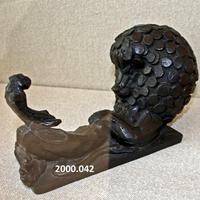 Bronze model of a monkey sitting on a lions knee. The lions mane is made of flattened spheres. This is perhaps a model for the Eastland Shopping Center sculpture which became the Lion and the Mouse. 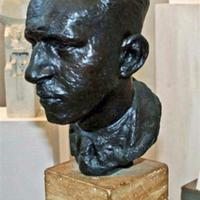 Bronze head of Adelbert Akusy with black patina mounted on brown marble base. No signiture, but inside of bronze is a label that reads: "C.M.A. 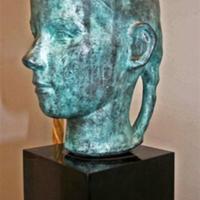 TUB 3589/47"
Bronze head of girl (Jean Raseman) with green patina on black marble base. The girl has braids in her hair. 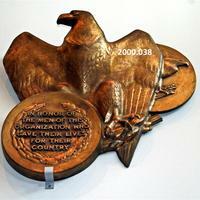 Bronze relief of Eaton Eagle, small-scale with copper colored patina with the inscription "In honor of the men of this organization who gave their lives for their country"
Posthumously cast of the Mouse from Lion and Mouse with foundry and edition marks and A.P. stamped/ inscribed in wax; also, interior edition mark stamped in wax. 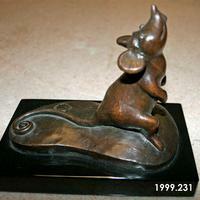 Mouse is mounted on a black marble base. 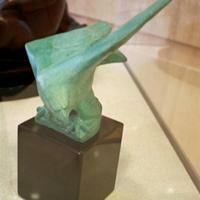 Posthumously cast bronze with green patina on black marble base of Ann Arbor Eagle.Foundry and edition marks and A.P. stamped/ inscribed in wax; also, interior edition mark stamped in wax. 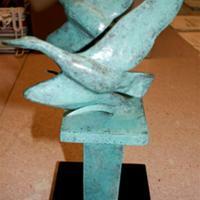 Posthumously cast bronze with green patina of Flying wild Geese on a black marble base. Foundry and edition marks and A.P. stamped/ inscribed in wax; also, interior edition mark stamped in wax.